When the command center for the Legion of Superheroes comes under attack by powerful villains Tharok (Peter Jessop), The Persuader (Matthew Yang King) and Mano (Philip Anthony-Rodriguez), they come up with a plan to trap them in time. Unfortunately, Brainiac 5 (Noel Fisher) can’t load the virus into the time travel sphere fast enough, so Starboy (Elyes Gabel) hitches a ride through time to finish the job. After crash landing on Earth in the past (our present), the trapped time sphere with the villains inside is taken to be studied by Mr. Terrific (Kevin Michael Richardson) and Starboy is found during a psychotic break by Batman (Kevin Conroy) and sent off to Arkham Asylum. One year later… Mr. Terrific and Superman (George Newbern) solve the mystery of the sphere and unwittingly unleash Mano, Tharok, and The Persuader which results in a battle that leaves Superman cut open and bleeding out! Meanwhile, when Batman and his newest protégé Miss Martian (Daniela Bobadilla) look in on Starboy thinking he’s just another mental patient, news footage of the fight with the future villains causes the future hero to go berserk and nearly destroy Arkham as he escapes to go stop the villains, knowing exactly where they’re going: in search of “Limelight” – the key to their plan to save the other members of the Fatal Five. Meet Jessica Cruz (Diane Guerrero), the newest Green Lantern of Earth. She’s a hero against her will who, due to survivor’s guilt from an incident from years earlier, would rather stay at home than join the Justice League. When the 3 members of the Fatal Five arrive in her town looking for her, however, she has no choice but to join the fight. 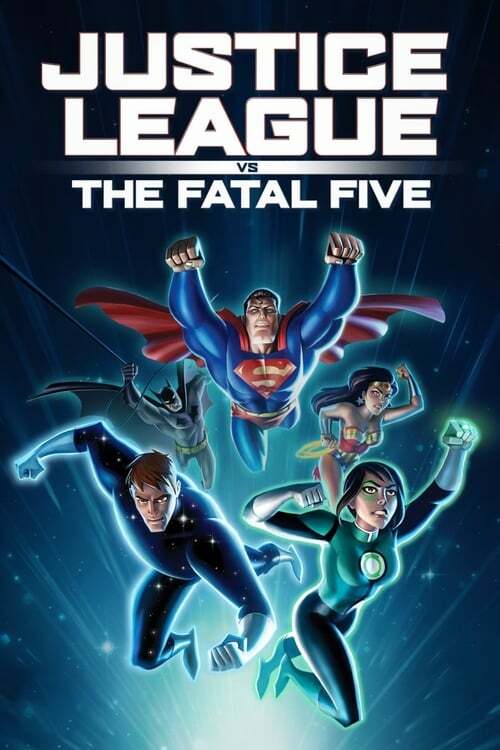 Justice League vs. the Fatal Five is the latest DC animated movie from producer/director Sam Liu (Batman: Gotham by Gaslight, The Death of Superman, Reign of the Supermen). Because of this, I was totally expecting it to be in the new sleek animation that so many of the “new 52” era DC animations have been done in over recent years. Instead, Liu chose to go old school with animation that matches Batman: The Animated Series (we even get the B.A.S. Batman Kevin Conroy), Superman: The Animated Series, Justice League, and Justice League Unlimited. I won’t lie, the animation style alone made me squeal with nostalgia for the look! The script, by Alan Burnette (Suicide Squad: Hell to Pay, Justice League: Gods and Monsters), Eric Carrasco (CW’s Supergirl), and James Krieg (Batman: Gotham by Gaslight, LEGO DC Comics Super Heroes franchise) felt less like a standalone movie and more like an extended episode of Justice League Unlimited. It has the feel of the series – stakes that escalate over time as the League discover what’s really going on, Superman being used as a jobber to show how strong the bad guys are, the main character of the episode having to find something inside themselves to persevere. Coupled with the familiar limited-animation style, its slightly confusing that the League seems oblivious to the Legion, despite having met them already in Justice League Unlimited (when Supergirl traveled with the Legion to the future). The best part of the story was how they handled Starboy. He functions as the often-over-looked idea of those with mental health issues. They’re often in real life simply ignored or thrown into the system without ever trying to really help them. Starboy suffers the same treatment thanks to Batman jumping to conclusions and completely misreading the situation (like many of our real-world cops and psychology professionals). This seemed to therefore contain a message about the treatment of those with mental health issues but failed in that even once it’s revealed that Starboy actually is the hero he claimed to be nobody ever apologizes to him for his mistreatment – they just talk amongst themselves that they were wrong. And, sadly, he never really gets the help he needs. The voice-acting was as great as ever, and I admit to being geeked to have Kevin Conroy once again reprising his iconic Batman role. All the other actors did great jobs in their roles, especially the villains who were given just as much character development as the heroes. Justice League vs The Fatal Five was an enjoyable film with some key moments that were as educational as they were entertaining. All of which are a lot of fun, even if I felt the overall story fell a bit short of really bringing home some of those messages though. I also loved the nostalgia of the JLU-style animation, even if it did make this feature-length production feel like an extended episode rather than a standalone film. Oh, and WARNING TO PARENTS: there is some swearing in this film (including the S-word, and I don’t mean Super). It may be an animated film, but these superheroes aren’t meant for young children!